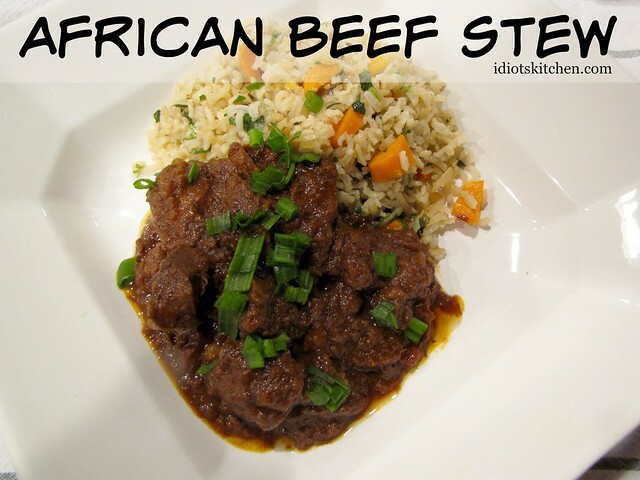 It’s too bad you have to rely on a picture and not on aroma for your introduction to African Beef Stew. Stew (and brown foods in general) rarely take a pretty picture. But the smell!!! The smell from cooking this stew was absolutely heavenly! I cooked this in my crockpot on my back patio and I’m pretty sure my neighbors got a serious whiff of this stew. In spite of the array of spices in the ingredient photo, this recipe is pretty basic & easy to prepare. The spices used here combine to make Berbere, a common spice blend used in Ethiopian cooking. Beef or Stew Meat, Onions, Crushed Tomatoes, Red Wine, Butter, Ginger, Cinnamon, Paprika, Cayenne Pepper, Cumin, Tumeric, Cardamom, Cloves, Allspice, Salt & Pepper. Yes, I realize that I’ve just cleared out your entire spice rack for one recipe but that’s where the incredible flavor of this stew comes from. All of these spices are easily found in the regular grocery store. If you have a place to buy bulk spices, you can get things like cardamom (which can be a little pricey) in small amounts so you don’t have to commit to a full spice bottle. That’s what I have in the little baggie in front of the paprika can. A little cardamom goes a looooong way. Check all those spices that have been lurking in the back of your cabinet since Thanksgiving because you might already have cloves, allspice, cardamom, and cinnamon. You can buy pre-cut stew meat but take a good long look around your meat counter before you do. Chances are that you can buy a better cut of meat for a lot less. Why pay someone else to cut meat into chunks when you can do it yourself? 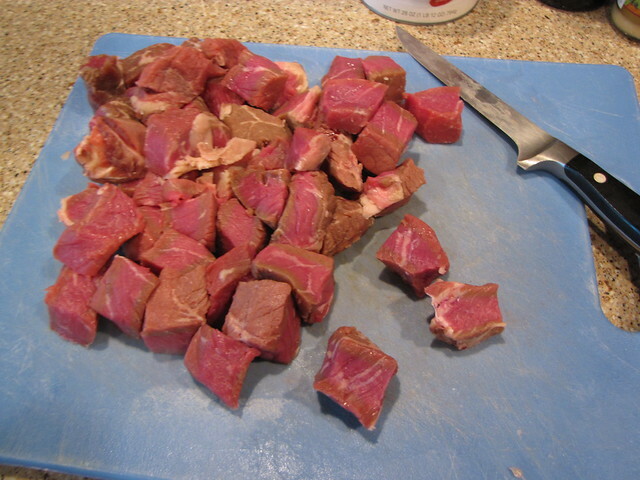 Plus what passes for stew meat at the store is often the scraps and full of gristle. I have about 2-2½ pounds of top round that was $2 a pound LESS than the crapola pre-cut stew meat. Score one for the thrifty shopper. Cut your beef into 1 inch cubes. I’ve mentioned before that I’m a pretty lazy crockpotter. 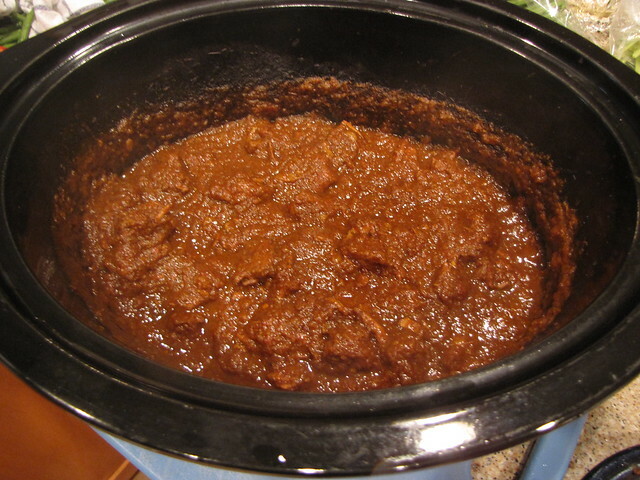 I don’t like browning and pre-cooking things…I like to dump and run with the slow cooker. That being said, for this recipe I think prepping the onions and browning them with the spices as you’ll see below, is essential to building the flavor of the stew. 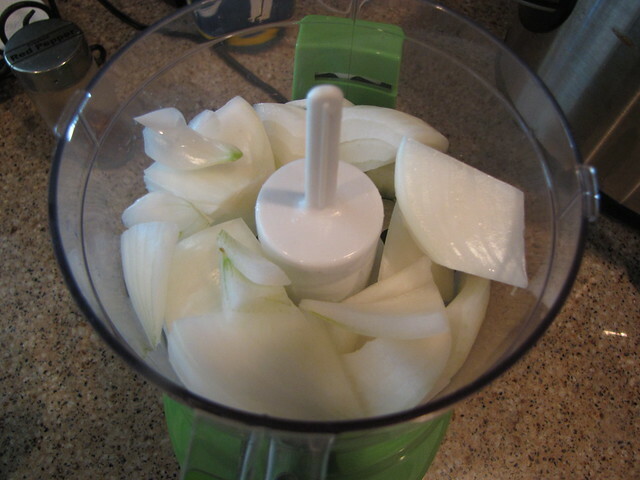 Peel and cut 2 medium onions into chunks and place them in a food processor. You might have to work in a couple of batches if you’re using a mini processor like mine. Pulse the onions until they are finely diced, almost pulp. 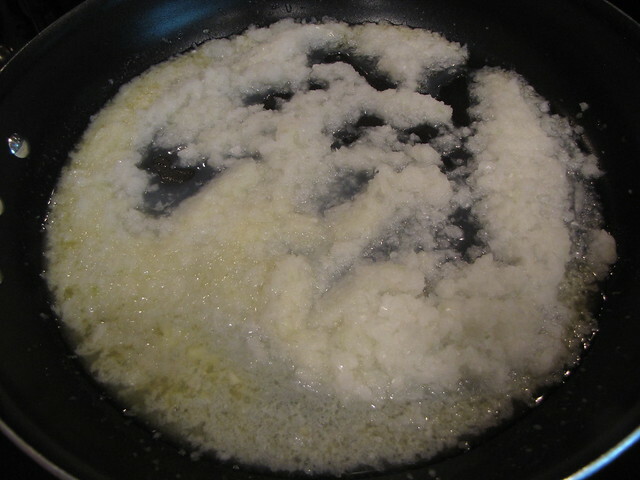 Melt 4 Tablespoons of butter (½ stick) in a large skillet over medium high heat and add the finely minced onions. 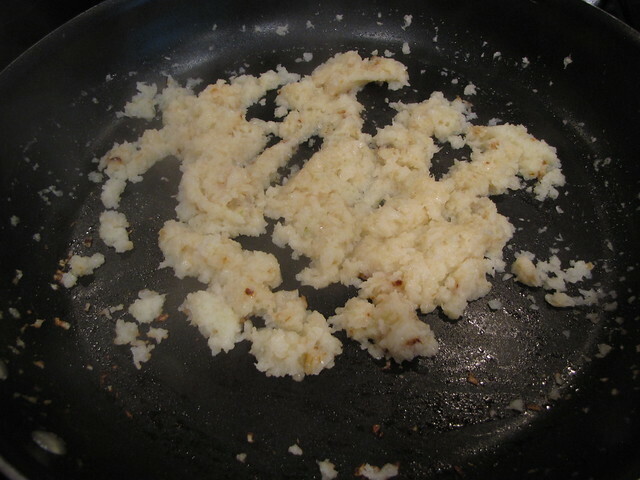 Cook the onions, stirring occasionally, until they are golden and just starting to brown – about 10 minutes. 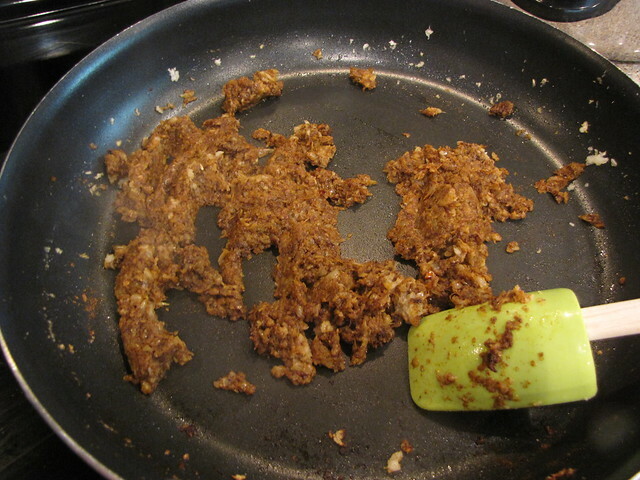 When the onion liquid has evaporated and they are beginning to brown, add 1 Tablespoon of minced ginger. 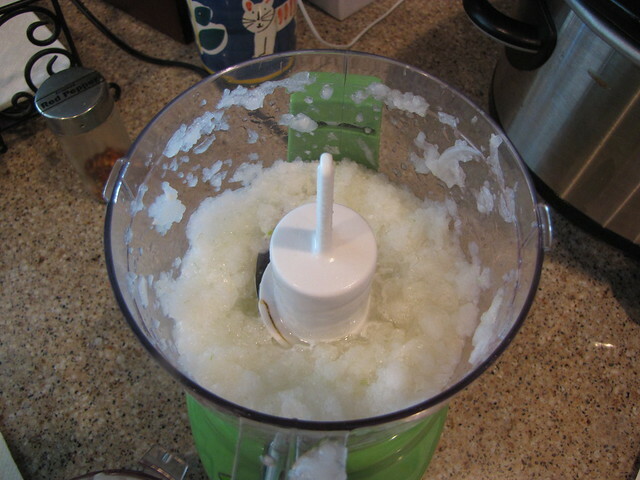 You can either use fresh ginger, peeled and grated or finely chopped, or ginger already minced in a jar. As much as I’m not a fan minced garlic in a jar, I LOVE pre-minced ginger. My ginger is always getting moldy in the fridge before I can remember to put it in the freezer or use it up. Keeping a jar of minced ginger on hand (found in the Asian section of my store) has saved the day on more than a few occasions when my “fresh” ginger was grody. While the onions cook, make your spice blend by combining 1 Tablespoon of paprika, 1 teaspoon cumin, and 1 teaspoon (or more) cayenne pepper. The cayenne gives this a pretty good kick so if you’re cooking for kids, use your own judgment on the spiciness. 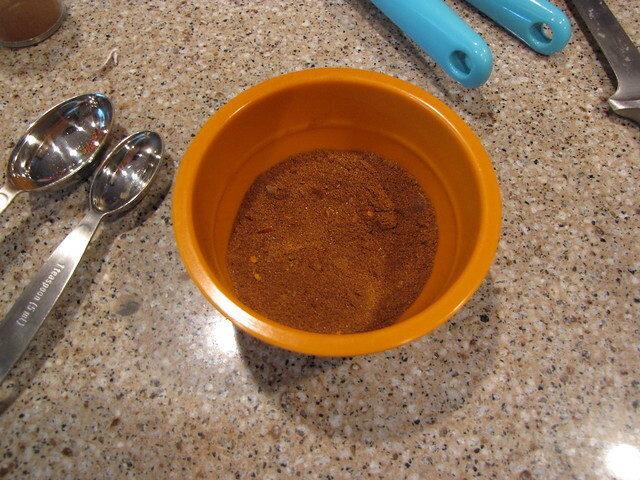 The original recipe called for 1 Tablespoon of cayenne. Wowza! Add ½ teaspoon EACH of ground turmeric, ground cinnamon, and ground cardamom and ¼ teaspoon EACH ground cloves and ground allspice. Give the spice mixture a good stir then add it to the pan of onions. Quickly stir the spices into the onions so that they are combined. Cook for about 1 minute and then remove the pan from the heat so the spices don’t burn. 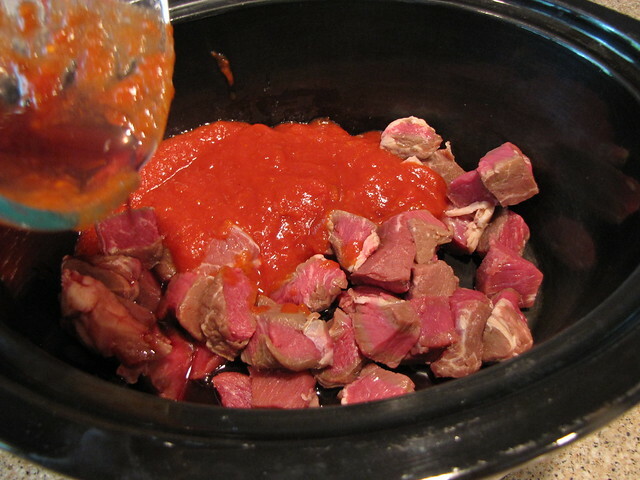 If you’re using a crock pot or slow cooker add the beef chunks, 1 (14 oz.) 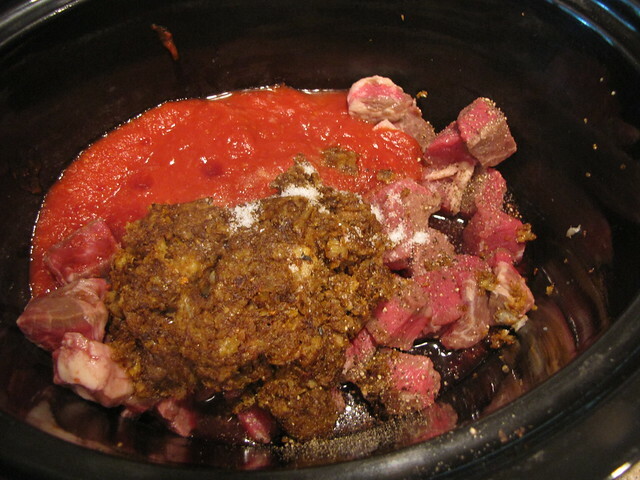 can of crushed tomatoes (that’s 1¾ cups in case you can only find the big cans), and 1/4 cup dry red wine. Season the beef with salt & pepper (I used about 1 teaspoon each) and add the onion & spice mixture. Stir to combine then set the crockpot to cook on high for 4-5 hours or low for 6-8. Don’t have a crockpot? 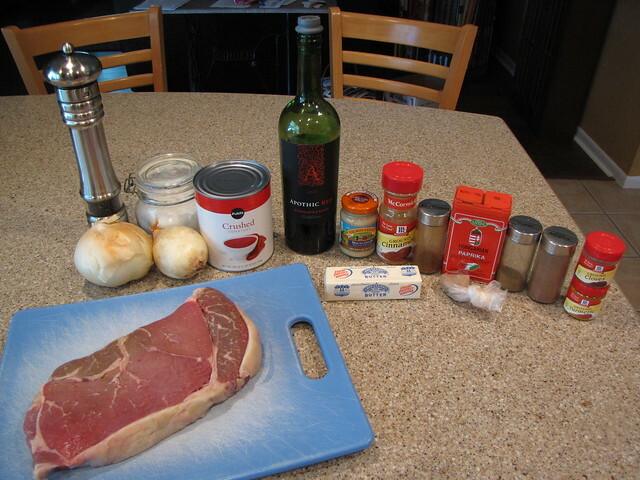 You can also just put all of this into a pot on the stovetop. Bring it to a boil, then turn the heat down to low, cover, and simmer for 2 hours. You can serve this with wide egg noodles, mashed potatoes, couscous, or rice. I spruced up some leftover brown rice with some sauteed carrots, onions, and a bunch of fresh chopped cilantro but to be honest, the stew is totally the star of the show so don’t get too hung up on what you serve it with. This recipe makes 4 moderate servings. However, I’ll definitely make a double recipe next time because the leftovers were amazing. Many thanks to my friend Jen for giving me the recipe! We were driving home from an orchestra rehearsal after a long week and talking about what food is easy to make when you have NO TIME to cook. We were comparing favorite crock pot recipes and she said that this was a huge hit with her family. Her boys especially love this. Kid approved! We’re all busy people so anytime the slow cooker can help out, I’m all for it. 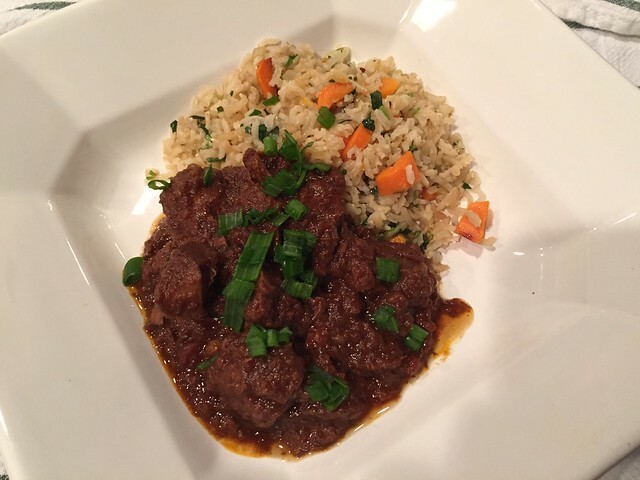 When it turns out something as spectacular as this African Beef Stew, then we’re REALLY in luck! And if YOU have a favorite recipe, crockpot or otherwise, please know you can always send them my way! I love suggestions from friends. I want to make this recipe this week! It looks incredible. My kitchen has terrible ventilation so I take the crockpot outside whenever I can. My parents take their toaster oven out on the patio for baking potatoes in hot weather rather than heating up the big oven. Smart! I wondered if the crockpot on the patio was a safety issue. My neighbors in a former neighborhood had their kitchen half burn down due to a c.p. shorting out. The responding firemen said that was ROUTINE (aack). However, I still use mine (knock on wood). The recipe looks terrific. Ha! Whenever I make something in the crockpot while we’re not home, my husband is sure I’m going to burn down the house. Of course, he thinks the same thing about my nightlights.